In the beginning, there was nothing but, darkness and then from a violent explosion, the whole story of space and time begun. This phenomenon in the history of our universe is known as the “Big bang”. This enormous explosion occurred 13.8 billion years ago and with this everything we see around us including space and time itself begun. Our universe seems so beautiful because of the illuminating stars and different colors that we often see in the pictures taken by different telescopic satellites and therefore we call our outer space as “HEAVENS”. But, in reality, the heaven is full of hells. Yes, there are dangerous places spread all around out there and it is quite obvious as the destruction is the mother of all creation and no matter how beautiful our universe is but, it started with an explosion. There are regions in our universe , not few but many in numbers , where high unstable energy interactions are going on and these interactions are far more powerful than any kind of nuclear explosions ; In fact, nuclear explosions and not qualified enough to be compared with such kind of interactions. Let us discuss these most violent places of our universe one by one. Normally, stars with such high mass must form a black hole but, there are certain star that typically losses some amount of mass right before the super-nova explosion. Hence, instead of forming a black hole they ended up in forming a “Neutron star”. This neutron star is the remnant of the original dead star which is now shrunk to a size of a state (, i.e., much less than the size of a moon) but, the density of this star is so heavy that a teaspoon matter of a neutron star is equal to the weight of the entire population of the earth. Sometimes neutron stars are formed with extremely high magnetic field strengths and these types of neutron stars is called as “MAGNETARS”. How powerful a Magnetar is? 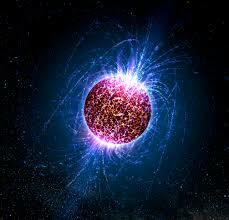 The magnetic field strength of a Magnetar is about 1000 trillion times than that of our earth. This immense power of a Magnetar can take out all the iron atoms from your body at a distance of about 100 thousand miles away which is half of the distance between the earth and moon. These mischievous stars have the strongest magnetic field in the universe and till now, scientist has discovered 12 of them in our own galaxy and there may be more of them in our own galaxy. When the magnetic power of a Magnetar gets incredibly strong then, it deforms the crust of the star and results a “STAR-QUAKE”. With the advent of a star quake; two high energy beams shoots outside from the two poles of the star. 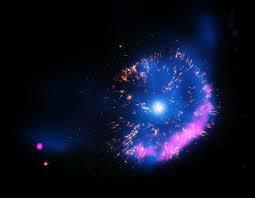 The energy beams are so powerful that it outshines all the other stars in the galaxy for a few seconds. 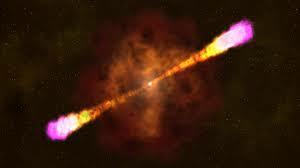 These high energy beams are the gamma rays moving at the speed of light and hence it is called as a “gamma ray bursts”. On 27th December 2004; satellites picked up the greatest explosion ever recorded and this was from a Magnetar present 30,000 light years away from us performing a gamma ray bursts. A gamma ray burst from 10 light years away can make chaos in our solar system and mass extinction in earth but, fortunately we are safe and there is no such chance. But this is indeed one of the hells residing in our universe. But, Magnetar are nothing as compared to something that we are going to discuss in our second part. Till then stay tuned and stay curious.